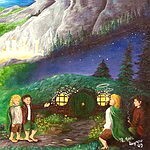 Happy Birthday Bagginses 2017, with jan-u-wine’s ‘A Birth Day for Heroes’, art by J. R. R. Tolkien. Yes! It is the big day for the Bagginses and in honor of the occasion jan-u-wine has written a glorious new poem, A Birth Day for Heroes. Set after the Quest in the Undying Lands, the Bagginses are on Tol Eressëa, Frodo reflecting on what has been, what is, and what might yet be. 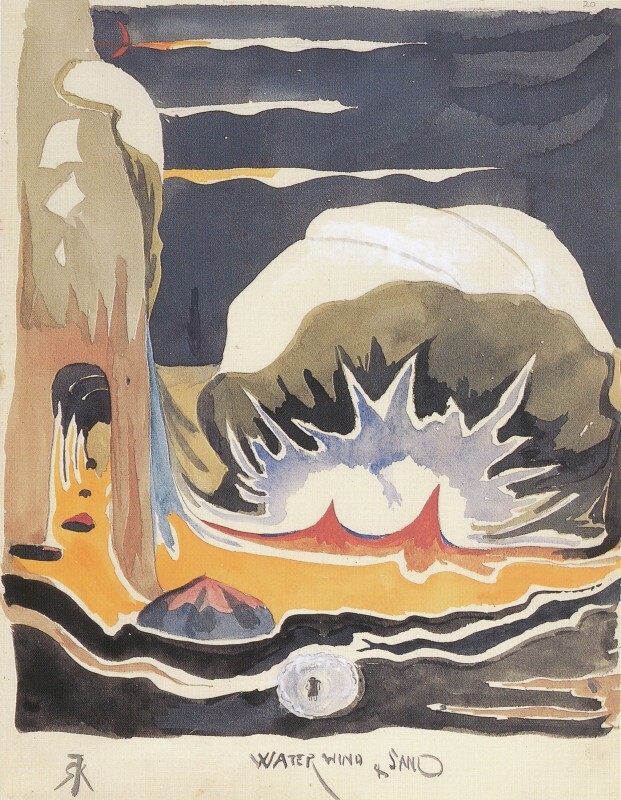 The illustration is a very early watercolor (July 1913) by Tolkien, titled Beyond. It is a color painting, but the only reproduction I have found is in black and white (see further discussion of the illustration below Jan’s poem). Still, even in black and white it has a lot of magic. 1913 was the year before Tolkien began to write for The Silmarillion, but even if he wasn’t actively writing about his secondary world, this picture makes me feel he was already forming that world in his head. When I look at its elements, added to the feel of it, I can’t help thinking it depicts a scene not of this world but of Aman, the Undying Lands. What I thought was a road going to the smaller pyramid-shaped mountain in the background, on closer examination is a long straight bridge flung across from the foreground, with its row of triangular shapes (hills? waves? ), to the base of the smaller mountain where it appears to end or enter in. It reminds me of the Straight Road, the trees and triangles in the foreground representing this world, with the sharp peaks beyond representing the other world, the moon and star hanging or rising over them, huge and silent. Very appropriate to a poem set on Tol Eressëa. cloaking us in enveloped peace. is not the same here. it is our birth day. a fire in the grate. 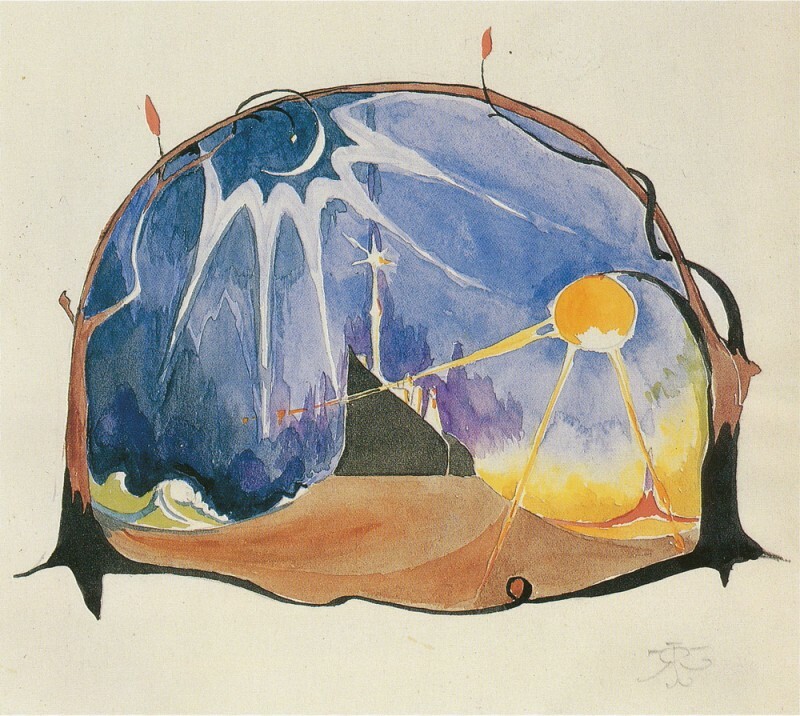 The Tolkien illustration from which Jan worked, the watercolor Beyond, was painted the summer after Tolkien turned twenty-one (Jan. 3), free at last to propose marriage to Edith Bratt. Perhaps being able publicly to acknowledge his love for Edith and feel confident in its return unleashed a stream of new creative energy. Early in July 1913 Tolkien bought a sketch-book and took it with him on a visit to his cousins at Barnt Green. Most of the book survives in the Bodleian Library, now separated into single or conjugate leaves, but the original order of its pages can be reconstructed with some certainty. It is a fascinating record of Tolkien’s growth as an artist over at least fifteen years, and also helps to document his writing. (…) Six days after drew the romatic ‘Northern house’, on 12 January, 1914, he tried on yet another style in the watercolour Beyond. Its elements are reduced to basic forms and are brightly painted by category: pink star, purple moon, indigo mountains, pink road, black mushroom-like trees. It is a strange work, like an other-wordly view of the Pyramids, and it has a puzzling rubbed inscription: 'Alas! [?] in dreadful mood'. If the artist was under a dark cloud, it is not reflected in his cheerful colours. ~ All Mechtild LJ entries featuring jan-u-wine's poems. WOW. I'm so moved by and grateful for Jan's incredible gift. Thank you for sharing it with us. Greetings, Shirebound, O Shining Star of New Jersey! HAPPY BIRTHDAY, FRODO AND BILBO!! Happy birthday to our wonderful hobbits!! Jan - beautiful poem, as usual!! And Shirebound - Love love love your profile pic!!! And to Mechtild - I'm so glad you're still posting here... even if most of your posts are imageless! I stumbled upon your post from August this morning. It makes me so glad I secretly stashed some of your beautiful manips on my phone!! I've been using them as wallpapers. Hope you don't mind! I'm going to try and release a new teaser today for a new story I'm collaborating on with my friend Sev Baggins on Fanfiction.net... No guarantees though. I've been rather busy and/or distracted as of late. :/ But I at least have to do *something* for the birthday of our muse! Have a blessed day!! And may our beautiful muse always be with you! Re: HAPPY BIRTHDAY, FRODO AND BILBO!! Diem Kieu, I am so glad you enjoyed the poem so much. I certainly did! I am sorry about the images, but it can't be helped. I am certainly not paying Photobucket hundreds of dollars to host the images they hosted from free since 2004. Shees! How I enjoyed the art, poetry, and accompanying essay. I could see the rose-opal color in my mind. It happens to be a favorite shade of mine --- the subtler, the better. And of course the First Song would continue to resonate 'across the universe', nothing to stop it. I had never thought of this before. If light keeps going, after all, so will sound... ? have expected! -- but he always surprises, and delightfully. Just as you two do. I'd love to see this piece in color, too. Jan found a color version of 'Beyond' on line, but the colors were not those described by Hammond and Scull. So we must presume it was a photo-shopped version of the black and white reproduction by some fan artist. "Tolkien: Artist and Illustrator" is a super book packed with fine commentary and lots of color reproductions, but there remain twenty-two reproductions of works using color elements (watercolors, colored pencils or inks) that are in black and white. I wish 'Beyond' had been one of the color ones. I really do think that Music and Light are two elements that belong together, journeying into the *forever*, taking us over that still-to-be-defined bridge with them. The Birthday is a happy day and these are the perfect images and words of beauty to celebrate. 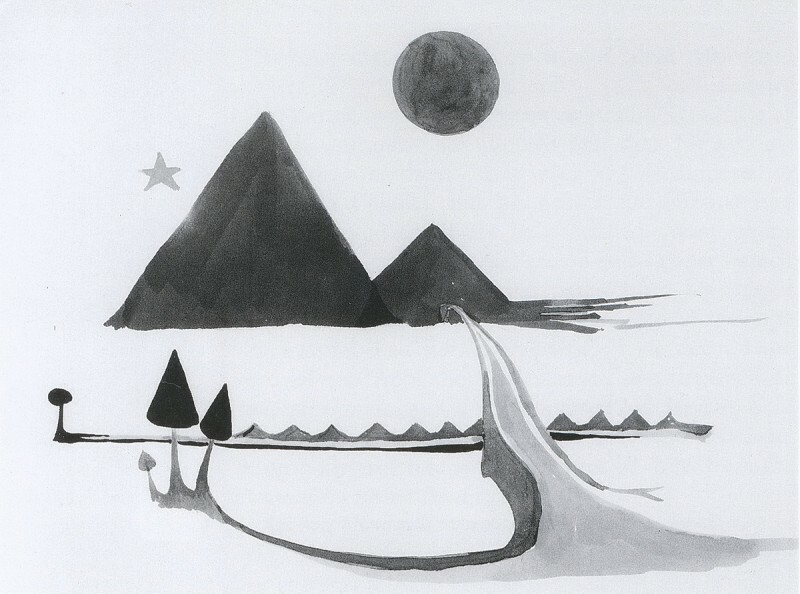 I think Tolkien would have made an excellent children's book illustrator as the eyes and imagination are drawn straight into the simple shapes and flowing lines and given freedom to wander. This lovely poem shows us ultimate faith, and a last act which becomes the first. Dreaming becomes waking to a beauty beyond dreams and the only true gift is one continually re-given. "I think Tolkien would have made an excellent children's book illustrator as the eyes and imagination are drawn straight into the simple shapes and flowing lives and given freedom to wander." Which is just what Tolkien does with his fiction writing--giving just enough detail to make it live, vividly, but never too much, always leaving space for the reader's "imagination to wander". I think Alan Lee said he tried to do what you describe in his own illustrating--always leaving visual space for the viewer's imagination to go further than what he has made explicit in the drawing or painting, extending and enriching their experience of the piece. Happy Baggins's Birthday to you both! Beautiful poem of them being unburdened across the Sea--thank you, Jan. It's so lovely to get this glimpse of their happy continuance. I love music tangling in Light's clothes--bringing the sense of touch into the dance of sight and sound. The scent of parchment and bindings mingling with sea salt must be there, too. Metchild, I guess the pink trilogy covers of the early paperback editions weren't so off, but picking up from the spirit of Tolkien's illustrations like this one. I like the glow of the star on the mountain--the only part of the pic that shows light reflecting. It's a very sparse pic. Yes, it is spare, Lavender, but it works for me. I'd love to see it in color. 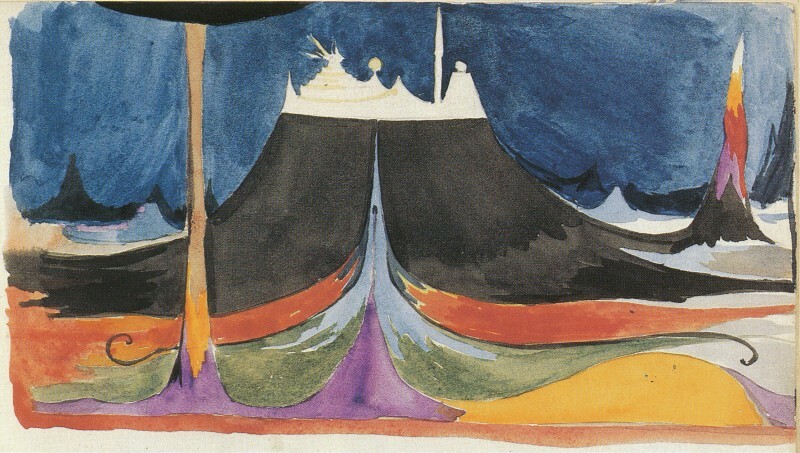 The colors described remind me of others of his early watercolors, very imaginative, with simplified shapes in compositions that flow, using bold but attractive colors. I'm thinking of the 1915 "Shores of Faerie" ( https://ic.pics.livejournal.com/mechtild/7380611/80100/80100_800.jpg ), 1914's 'Water, Wind and Sand' ( https://ic.pics.livejournal.com/mechtild/7380611/104239/104239_800.jpg ), or 'Tanaqui' from 1915 ( https://ic.pics.livejournal.com/mechtild/7380611/104652/104652_800.jpg ). I love what you say about how the poem engages all the reader's senses: "music tangling in Light's clothes--bringing a sense of touch into the the dance of sight and sound. The scent of parchment and bindings mingling with sea salt..."
Oh my goodness, you're still on LJ! Now and then. Ah, sweet memories of the great golden age of Tolkien fandom. :) My first, and greatest, fandom (followed by HP). There won't be another. I have the Scully/Hammond book, and it's great, but I confess I've never read it in detail. That 'Beyond' pic is so mysterious and yearning somehow. 1913. The year before the Great War. It seems eerily prescient. As ever, wonderful poem from Jan.
Pearl, hello! I am delighted to see your comment. Yes, we have been "active", if posting an entry once a year is considered active, ha ha. I haven't been involved in any fandom since LOTR. Although I enjoyed Harry Potter a lot (still listen to the audio books periodically), and have come to be an enthusiastic fan of Doctor Who through Jan, I have no desire to talk about them on messageboards or in blogs. You have seen me on Facebook? It must be on my husband Glen's page. I never post anything in mine, but he likes posting stuff. Yes, I have a radiant smile in those pictures all right. Glen is very good about not posting photos I would hate, ha ha. Do you remember recommending the "Hawk and the Dove" series to me a couple of years ago? I really enjoyed them, even if I thought her language sometimes anachronistic. I am up to "The Beautiful Thread", which I plan to read after Christmas. HAPPY BIRTHDAY TO FRODO AND BILBO!! (2018! Happy Birthday to both our beautiful Frodo and Bilbo Baggins!! I am about to celebrate by making (or at least, attempting to make) a savory pie fit for a hobbit feast and watching LOTR all over again! What about this community?? How dost thou? Re: HAPPY BIRTHDAY TO FRODO AND BILBO!! (2018!